Entrepreneurship analyzes a very wide field of study and, at the same time, it converges with many topics, including the characteristics of entrepreneur, conditions that favor entrepreneurship, resources and funding sources, legislation, family businesses, succession protocols, learning and teaching of creating enterprise, and typologies of entrepreneurship. Social entrepreneurship is characterized by its input in creating value, and given the activities carried out by entrepreneurs, they have a big social impact, especially in communities and vulnerable groups but not exclusively, as many social entrepreneurial initiatives are forms of social benefit, and they do not circumscribe to particular conditions of vulnerability. Around the world, Governments, Civil Society, Private Sector and Organizations have focused the generalized interest on social problems and sustainability, linked to social value making and human development, whit the purpose of integrating and uniting efforts to the promotion of equity in quality of life. These strategies include to potent entrepreneurship and create enterprises oriented to overcome environmental, social and economic challenges that affect the world. From the French word entrepreneur1, entrepreneurship has identified form the 17th and 18th centuries to those persons who are in charge of the things happen and metaphorically they had identified with the role of architects, because they were who undertook the work of building, by their own initiative as well as by request, and took to reality. In the same metaphoric sense, it identified two kinds of persons: the adventurous warrior who undertakes a fight or a great achievement, entrepreneur, or the Head of the State who planned strategies and politics, intraentrepreneur (Verin, 1982 quoted by Rodríguez, 2009:86). At the end of the past century, the term got the space to explore it form different ambits: economic, social, institutional, academic, psychological and administrative or management and it recognized the link between the spirit of enterprise, economic growth and development of the life conditions in the territories. From this statement, it was based the meaning of growth as the goal to get the development. The consequences of this presumption took the world of today to accept that that growth is not a synonym of development and, in some occasions, it is not even a goal to get developed. Austrian Joseph Alois Schumpeter is recognized for his contribution to the study of social development and its relationship with entrepreneurship, from the concept of innovation and what an entrepreneur does. All his economic theories refer to something more than simple functional and dynamic logic of economic process; they refer to life and growth of a civilization, of which industrial system is part of it, with entrepreneur as creative spontaneous leader amongst businessmen helped by the credit, provide innovations to keep the vigor of economic development2 (Schumpeter, 1912). In his work The Theory of Economic Development, published in 1912, he lays out that the economic development has a cyclic character, and it involves a driving force which it is the entrepreneur, a process that it is dynamic and transforming, based on innovation, a tool what it is the creative destruction and a goal that is the profit. This circuit has movements, indefinitely repeated phenomena, it means, factors and methods are immutable. For not continuing with this situation or seasonality, which it is near to not-development of economic system, it is necessary a mechanism of change, the driving force, to introduce the innovation, that it is a characteristic act of the entrepreneur, with the decision that he/she has to carry new combinations out (innovation) introducing whether a new source of material, a new good, method, market or establishing a new organization, in any kind of entrepreneurship. 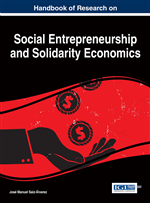 The social entrepreneurship, which it has to do with sensibility and ability to recognize business opportunities which their impact is focused on improvement of quality of life, on creating social value, from a management focus, where the opportunity is a desirable future state of welfare, which it requires the introductions of goods and services through the creating of alliances (Marijek et al., 2004).